Founded in 2009, Bank of America’s Merchant Services is a product of a partnership between First Data, one of the country’s largest payment processors, and Bank of America Corp. However, the merchant services themselves are offered by Bank of America and Bank of America Merchant Services, LLC. Now that we’ve established that, what makes Bank of America’s Merchant Services so great? Well, it’s one of the largest merchant service providers in the U.S., for starters. To put it into perspective, Bank of America Merchant Services processed nearly $350 billion in credit card payments in 2012. That’s not a small chunk of change, and it’s one of the reasons why Bank of America has been rated an A+ with the BBB. In addition to its incredible BBB rating and sheer size, what else sets Bank of America Merchant Services apart from other merchant services? 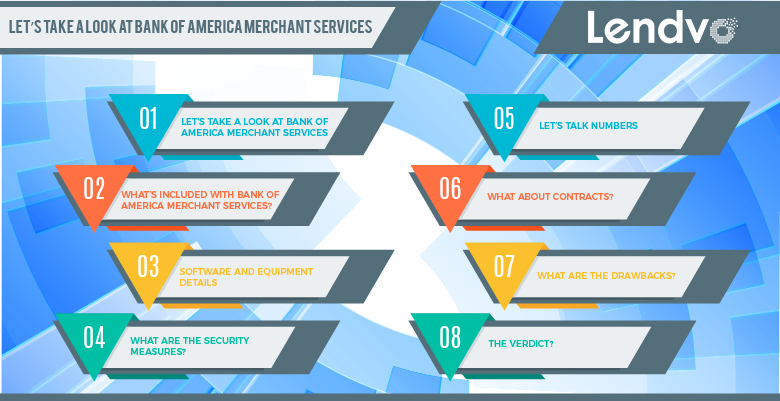 What’s Included with Bank of America Merchant Services? Card Processing: Bank of America Merchant Services accepts all kinds of credit cards, including MasterCard, Visa, Discover, Diners’ Club, American Express, and JCB. Additionally, many debit cards are also accepted. Check Processing: Bank of America Merchant Services understands that some people still prefer to pay with checks, which is why it accepts electronic checks with warranty or verification. The difference between the two is that the warranty option requires a certain level of authorization in order to reduce fraud. The verification option actually screens checks in an effort to keep returned checks at a minimum. As a result, the check processing service ends up being more secure, and both the warranty and verification options accept paper checks. Mobile: People like being able to use their mobile devices for virtually everything. Fortunately, with Bank of America Merchant Services, users can accept payments from virtually anywhere thanks to its mobile capabilities. By using mobile pay apps or systems, users can enter credit card information in order to process transactions quickly. For peace of mind, advanced security measures are available for both options to keep sensitive information secure and ward against fraud. Receipts can also be emailed directly to customers. E-Commerce: Bank of America Merchant Services realizes that many companies conduct business online, which is why it has designed the Compass Platform. This platform allows for real-time authorization, ensuring that all transactions are processed quickly. Additionally, there is Global Gateway e4, a PCI-compliant e-commerce payment gateway designed to integrate with existing websites or blogs. An added bonus of this particular option is that it allows users to accept mail order and phone payments. Payroll Services: For businesses looking for payroll services, Bank of America Merchant Services has you covered with its Money Network solutions. With this solution, users can offer employees the option of electronic payments, compliant with the payroll requirements found in all 50 states. Additionally, checks and all major cards are accepted. In addition to its many convenient services, Bank of America Merchant Services offers a variety of software and equipment solutions to choose from, depending on the needs of a user. Let’s take a look at some of the options. Retail Solution: This allows users to use a computer in place of a cash register. Designed with an Intel processor, the Retail Solution accepts most payment options and allows users to track sales, manage inventory, and much more. The handy device even comes equipped with installation support and touchscreen technology, all without annoying maintenance fees. Restaurant Solution: This solution combines software designed for restaurants and a computer, allowing users to manage everything from employee timekeeping and weekly specials to sales and much more. It even comes equipped with installation support, and the software allows users to set up menus easily. Again, this option is maintenance fee free. Clover Station: This is one of the solutions that Bank of America Merchant Services is best known for, and rightly so. It operates on a user’s tablet and functions as a comprehensive point-of-sale system that includes everything a user needs to begin processing transactions, including cash drawers, printer paper, receipt printer, an actual tablet, and all the necessary cables. Countertop Terminals: In addition to these solutions, users have access to an assortment of countertop terminals. Some terminals include built-in printers, touchscreens, integrated check readers, USB ports, security encryption, and PIN pads that can integrate with existing systems. Additionally, users can also choose to lease a credit card machine, depending on their needs. When choosing a merchant service, it’s important to consider the security measures available. Fortunately, Bank of America Merchant Services has many tools available to keep transactions and data secure, thanks in large part to TransArmor, a security feature from First Data that protects data via encryption. The merchant service also protects check transactions with its Telecheck Check Guarantee, and Fraud FlexDetect helps users detect fraud and other suspicious activities. According to the Bank of America Merchant Services’ website, rates for swiped transactions vary depending on the total amount of a swiped transaction. For example, transactions between $0 and $4,999.99 have a rate of 2.50% + $0.20, while transactions between $5,000 and $9,999.99 have rates of 2.30% + $0.20. For some cards, like American Express, the rates vary depending on the merchant, and certain cards are charged an additional rate of 0.4%. On top of these fees, other fees and rates might apply depending on the situation, and oftentimes what a user pays can be very different from the rates published on the Bank of America Merchant Services’ website. Bank of America Merchant Services binds customers to 3-year contracts that auto renew each year if they’re not canceled. These contracts can be canceled early, of course, but you will have to pay a fee of up to $500. We’ve touched on many of the popular services and features of Bank of America Merchant Services, but what are some of the drawbacks? Well, it doesn’t have the best pricing around. Given its sheer size, one would think its pricing would be more competitive, but it’s not. Additionally, some customers have accused its pricing system of being misleading. How so? Well, because of its tendency to use bundled surcharging, which is a sort of tiered pricing system that has many levels of surcharge categories. The sheer number of categories can be overwhelming and makes it difficult for customers to find out the real cost of a transaction, let alone get the necessary information to calculate Bank of America surcharges on transactions. Another drawback to Bank of America Merchant Services is its predatory, expensive leases. Anyone who has ever worked with Bank of America Merchant Services knows all too well how it has the tendency to push equipment leases on individuals and businesses. Despite many consumer complaints about this often predatory practice, Bank of America still offers equipment leases through First Data. There’s no denying that Bank of America Merchant Services does indeed offer many convenient options to businesses. Its impressive list of services and quality software and equipment options are enough to help any business, no matter the size, process transactions and meet the demands of its customers. However, businesses would be wise to consider its often criticized features, such as the lack of transparency in its pricing and its heavy emphasis on getting businesses to lease equipment. At the end of the day, however, the decision of what merchant service to choose comes down to what works best for an individual business.